The Internet and digital technologies have changed the world we live in and the ways we engage with one another and work and play. This is the starting point for this collection which takes analysis of the digital world to the next level exploring the frontiers of digital and creative transformations and mapping their future directions. It brings together a distinctive collection of leading academics, social innovators, activists, policy specialists and digital and creative practitioners to discuss and address the challenges and opportunities in the contemporary digital and creative economy. 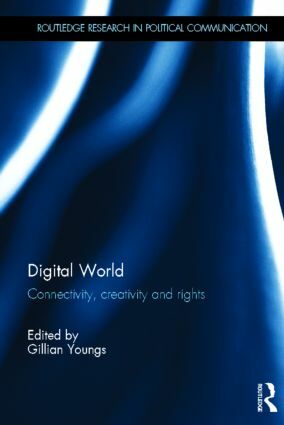 Contributions explain the workings of the digital world through three main themes: connectivity, creativity and rights. They combine theoretical and conceptual discussions with real world examples of new technologies and technological and creative processes and their impacts. Discussions range across political, economic and cultural areas and assess national contexts including the UK and China. Areas covered include digital identity and empowerment, the Internet and the ‘Fifth Estate’, social media and the Arab Spring, digital storytelling, transmedia and audience, economic and social innovation, digital inclusion, community and online curation, cyberqueer activism. The volume developed out of a UK Economic and Social Research Council funded research seminar series. Gillian Youngs is Professor of Digital Economy and has been researching diverse aspects of the internet's impact on society and economy for 15 years developing out of her early focus on globalisation. She has given invited keynote and guest papers internationally in the US, China, South Korea, Turkey, Hungary, Germany, Holland, Spain, Austria, Tanzania.